Emily had surgery this week. A complex rearrangement of muscles and tendons in her right arm that will allow her to lift her wrist upward and to position her thumb for an effective pinch and some grip. Emily agreed to have the surgery because she has benefited from increased function following her deltoid to tricep tendon transfer last year so the opportunity to stabilize her wrist was appealing. Her only condition when she consented to the operation was being discharged within 24 hours. The upper arm surgery last year allows Emily to straighten her elbow against gravity, to place her hand where she intends and to push away from herself. These basic movements give Emily the ability to keep her elbow straight so that today’s surgery can work effectively on the wrist. Today’s surgical technique will see the Brachioradialis tendon (in the elbow) detached and sewn into the Extensor Carpi Radialis Brevis muscle (forearm) so that when Emily tries to bend her elbow her wrist is pulled up. Secondly the Flexor Pollicis Longus tendon, that bends the last joint of her thumb, will be cut near the wrist, pulled tight and reattached into her radius bone (forearm). This is done to provide a better position of the thumb against the index finger for a pinch grip. We were up pre-dawn, ready and waiting for our taxi. There were no long wheel based taxi cabs available so we had a quick change to plan B and took the family car and the collapsible wheelchair. We arrived just on time and the admission procedure into operating theatre twelve ran smoothly. Gary and I were having our first coffee at 8.30am having set up our base camp behind a pillar, in a quiet corner of the canteen, except no-where is quiet in a hospital canteen. And so the wait began. I knew I’d waited too long as I began policing the ground floor toilets. The paper hand towels ran out mid morning so while flapping and clapping my hands dry I found a member of staff and reported this service requirement. “I’ll ring the girls as soon as I go back to my ward” was her reply. I checked up on the situation during my next tour of duty around the hospital concourse perimeter, the hand towels had been reloaded. I was pleased as I realised the ambiguity of her answer, she could have been stopping for a quick pee prior to her Christmas break? Luck would have it that she did return promptly to her ward and the paper towels were replenished. I felt like a RNSH caped crusader without a cape or mask. Waiting, waiting, waiting for Emily. I reflected that I had felt dubious about this hand surgery because in the last two months so much has been published about the cell transplantation success in Poland. I wondered upon the time line before we see cell transplantation as a treatment choice for spinal cord injury? Emily stopped my thinking in its tracks by her straight-forward directive “I can’t live waiting for a future treatment. Cell transplantation could take 10 years, I aim to live to my full potential now” The truth is we really can only discuss cell transplantation therapy when there is a reputable Australian centre offering evidence based treatment with clinical success in a price range that is affordable or offered on Medicare. Emily’s clarity of thought drives her, she is not putting her life on hold for anything. The anesthetic nurse called to let us know Emily was warded on 7E and fine. Gary and I arrived on the swanky new spinal unit to catch her cheeky grin. The procedure was successful and Emily has a plaster cast from her elbow that includes her hand. This crude looking post operative cast is formed from white chalky plaster strips which gives it a bulky, rustic appearance. The surgeons’ instructions include keeping the arm elevated to reduce swelling and any pain. 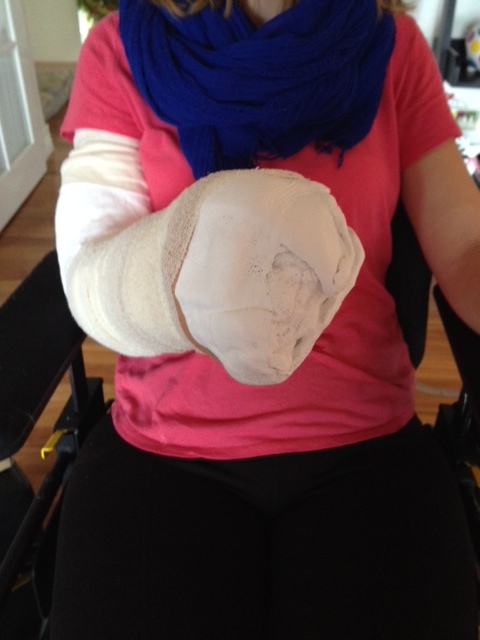 Within 24 hours we are home and managing this massive chalky white fist shaped cast in Emily’s routine. Emily is delighted that all went well, she’s excited to see the surgeon next Thursday when the original cast will be reduced and a light fibre one replaces this bulky weapon. I will be pleased if I dodge getting a black eye from her massive boxing fist and I look forward to Emily gently pinching me very soon! This entry was posted in Medical Issues and tagged Brachioradialis tendon, Brachioradialis to Extensor Carpi Radialis Brevis Surgery, caring, Change, Everyday Caring, Flexor Pollicis Longus into the Radius surgery, hand surgery, Plaster cast, spinal cord injuries, Surgery for improved hand function in quadriplegia, Surgical technique for tenodesis, Tendon Transfer Surgery, Tenodesis by everydaycarer. Bookmark the permalink. Wonderful news and heartfelt wishes for speedy recovery of her new wrist weapon. Think Sally may be peeved by appearance of puppy but suffering thru arm surgery warrants radical reward, I say now that Im a resident expert on such matters!